A day at "El Rancho." Don't miss out on the most beautiful aspect of Mexico - its people. Or "How to Lose a Mexican Friend Almost Immediately"
Not long ago, I invited a Mexican girlfriend over for dinner at the house where I stay in Guadalaraja. She arrived around ten at night. In between Heinkekins (Mexicans' favorite beer) and spaghetti (my go-to dinner in unfamiliar kitchens), we shared a little about our family histories. I marveled to myself how much a woman from rural Oklahoma could have in common with a woman from rural Sonora, Mexico. We had both elected lives independent of our families and moved out of state. We both took risks that were unconventional in our day. She was her family's first college graduate and left her pueblo. I was the only person I knew of from my hometown to go to college in Europe. Being the only daughter in a family of 11 children, my friend had been under considerable pressure to stay and take care of the aging parents. She managed to support them better than her 10 brothers even after she'd moved. We both had struck out into the unknown and knew its price. My friend doesn't have a large network of family support like most Mexicans have. I too know that loneliness. All of this ground was covered in my very imperfect Spanish, proving that you don't have to speak the language perfectly to develop intimate friendships. Most expats, however secretly, crave Mexican friends. Even with a large expat social circle, expat still know that they are missing out without them. You see Mexicans your age and ache to participate in the warmth and camaraderie that's distinct to Latin culture. This is particularly true if you are female. It's common to see large tables of Mexican women in restaurants seemingly doing nothing more than cooing at one another. If not the language then, what are some of the barriers Anglos erect to friendship? Where do many potential friendships go off the rail before they even begin? The clue can be found in the scenario I just described. If you didn't catch it, imagine for a minute that you're back home in the U.S. or Canada. You are visiting a friend at his house. It's a little later than usual. You're enjoying yourself. You're telling your host a story or anecdote. You see him glance at his watch. Now multiply that feeling by ten. That's how your prospective Mexican friend feels. "But", you may say, what if you're really tired? Maybe you've done a lot of housework or didn't sleep well the night before. You go to bed at 10:00! What do you do when they don't leave when you're ready to retire? And I don't mean making it obvious you're tired; the nearly passive-aggressive yawning, letting your eyes droop and responding minimally to what's going on in the hope that they'll notice and leave, the method that works so well at home. Sure, your new Mexican friend will leave. Unlike your friends at home, however, they won't come back. Instead, you must engage. You must respond with whatever energy you can summon, tapping all your resources (coffee, tequila) if necessary. Otherwise, you can requisition yourself to a limited range of social options that include solely insulated expats, happy hours at 5:00 p.m. and lunch on Tuesdays. In this specific blog, however, I'm talking to the select subset (Most likely this won't be my most popular blog.) who want more, those who are willing to put as much time into learning some Spanish as they do watching television and reading in order to make a few Mexican friends. These are the expats or potential expats who really do want the adventure of living in Mexico (They are also those who can intuit how important Mexican friends might be economically; as they know a great deal about costs in Mexico that expats don't). In general, Mexicans operate on different biological clocks than Americans, at least two hours later. Mexicans go to work later, take a few hours at lunch (although not a formal siesta, they go home, give the office to underlings and don't come back until after 2:00 and then work until 7 or so). Dinner might be at 9-10 at night. I've gone to parties in Mexico and seen 90-year women sitting quietly in the corner wide awake at 3:00 a.m. They've kept this schedule their entire lives. They understand that these are the important moments. Even when they aren't saying a word they are fully conscious, these old women, watching the antics of the couples, teenagers and younger adults around them. Many expats proudly announce their precious bedtimes to the world and then seem bewildered that they never get invited to Mexican social events and functions in spite of their passable Spanish. Mexicans soon give up on stopping by when expats lower the shade at 8:00. I can't help but think many of these expats are going to wish they'd summoned up their reserves, fought off their fatigue and shared some body heat while they could. Making friends just gets harder, not easier as we age. Just like in college, some of the most revealing, bonding conversations you'll ever have will take place after midnight when people's guards are down. These moments don't always come at your convenience, on your sleep schedule. You can't expect Mexico to conform to your sleep schedule any more than you can expect it to speak your language. You are not a slave to your body clock. You have probably forgotten how you gradually shifted your sleep schedule from all-nighters and sleeping 'till noon when you graduated from college in order to keep a 9-5 job. Your schedule change wasn't your body clock urging you on, but rather vocational exigencies. Don't surrender to a grumpy expat schedule. Take a mid-afternoon nap. Drink a spot of coffee around 4:00. Do a little exercise later than you otherwise might. Accept that invitation a salir at 10:30 at night and grab a nap at 8:00 beforehand. Experiment with your routine and see if you can't align it a little better to the rest of the hive. Otherwise, you will find yourself continually arriving too late to the cultural buffet table. The real occasion, the one everyone talks about, will start two hours after you leave. You want to answer the door and stay up with your Mexican friends for the same reason you will stay awake for your grandchildren, and for the same reason that you used to have one more drink with your boss: They are important to your life. Whenever we are together, we are in each other's keeping. Everything is not all about you, by the way. So buck the f**k up. Gloria Piña of Guadalajara joins the list of charming rental concierges for my book "If I Only Had a Place," and tells you what she loves about Guadalajara. Regardless of age, teaching English can be a great gig in foreign countries, where demand is very high. There are easy and cheap ways to ease into becoming a English teacher in Mexico without the cost and time investment of expensive certification programs. Hi, I'm Kerry Baker and author of two books. The first is the Interactive Guide to Learning Spanish Free Online. Get started now to be conversational in Mexico. Get bored too easily? The number of tools in this book will enable you to have a different lesson every day, with free tools you'll never find in a Google search. Use it with a laptop (like I do on my elegant Acer Aspire) or a tablet or e-reader. 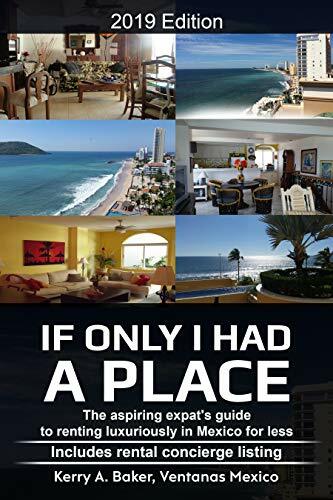 The second book is "If Only I Had a Place," [reviews] which will give you the cultural and pragmatic lowdown on renting in Mexico along with a listing of rental concierges who can take a look (and pictures) of a place before you rent it from a distance. It's more than just a "how to. ." It's a fluid system for renting well year after year.